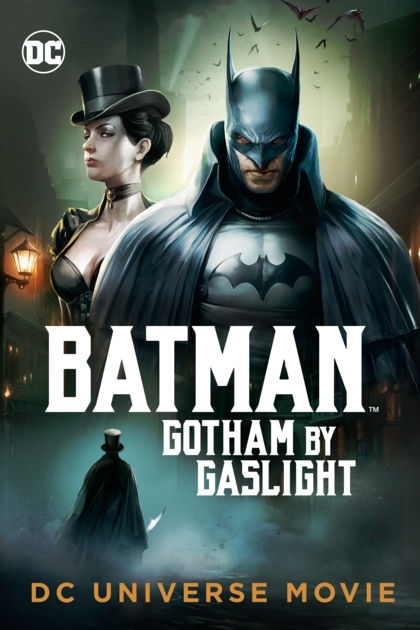 In the late 1800s the women of Gotham City are being mercilessly slaughter at the bloody hands of the infamous Jack-the-Ripper. The city’s police force has proven themselves to be completely incompentant and not even Commissioner Gordon has had any luck with catching the Ripper. The only hope that remains is with the mysterious creature which preys upon the city’s criminal scum, the Batman. Batman/Bruce Wayne – This iteration of the character is very interesting because Bruce seems to have a better balance between his two personas. Additionally, while the character is still serious he is not completely lost himself in his self-imposed darkness. I have to stress this not a jokey Batman, but instead one is not so paranoid that he becomes a sociopath. Batman is voiced by Bruce Greenwood. Mr. Greenwood is returning to the role, he has previously voice the character in Batman: Under the Red Hood and Young Justice. Selina Kyle (Catwoman) – The character was never in the original one-shot by Brian Augustyn and Mike Mignola, but I feel was a welcomed addition to story. If you are looking for Selina to put on skin tight leather then I’m afraid you’ll be disappointed, but rest assured you’ll seen plenty of bullwhip action. In the film Selina is on her own hunt for the Ripper because she feels that no truly cares what happens to the women of destitute who live in Gotham. The character is voiced by Jennifer Carpenter (Dexter). The style of the animated is reminiscent of the WB animated series “The Batman”, which we can only describe as a Western Style with some anime influences. While I enjoyed the movie, I would be remised if I did not point a couple of things that maybe some of the more passionate superhero fans may not be so pleased to see when they watch it. First, the movie’s story deviates heavily from the original comic. While other DC animated movies have definitely done a better job of mirroring their comics, this one seems to pick and choose with what it brings to the table from the source material. Second is some of the characters that we are all familiar with may act of way different than from what you are used to seeing before. Keep that in mind and remember this is an DC-Elseworlds story where we can see are favorite characters behave in vastly different environments, have new backstories, and share unique dynamics between each other.